Risk of impact = Probability X Magn​​​itude X Vulnerability. With increasing climate change the more vulnerable populations will suffer greater impacts or losses. o Climate change driven increase in communicable infectious ​​​​​​and vector diseases will make populations and individuals more vulnerable. ​​Though the IPCC recommends the standard science of risk definition, it leaves it up to policy makers to apply it. The IPCC assessments of future impacts are based on the scientists computer model projections of the rate and degree of warming. Then the multiple impacts of global warming and climate change are also derived from other computer model projections. These levels of computer model projections give results that all have large ranges, which the IPCC calls 'uncertainties'. How ever from a risk perspective the upper ranges of future temperature and of crop yield declines (the greatest uncertainty) are the greatest risks to apply for policy making. 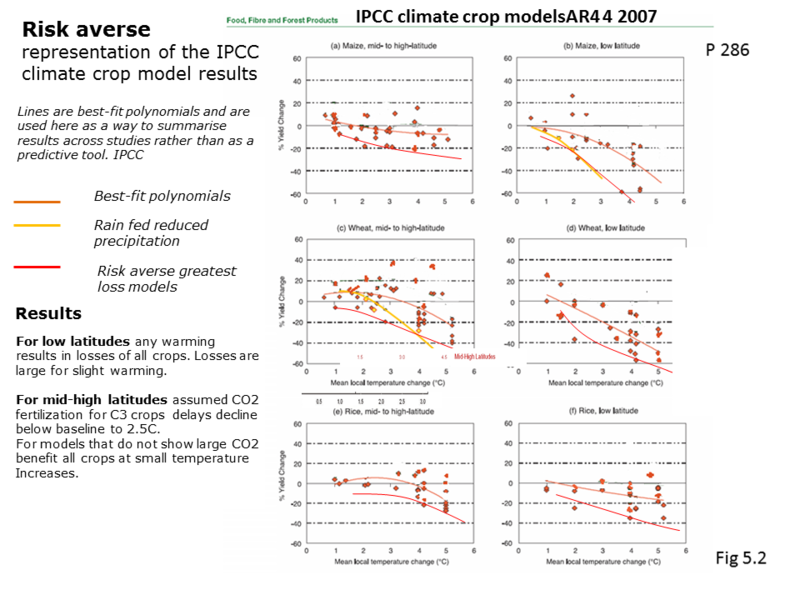 The graphic above shows how the IPCC crop model results can be used to accommodate risk, by applying a standard environmental health risk method of taking the worst case plausible result. A plausible result is determined by weight of science evidence. The IPCC lumps all the published results together, irrespective of year published, or evidence included. It then takes a rough mean through all the results. 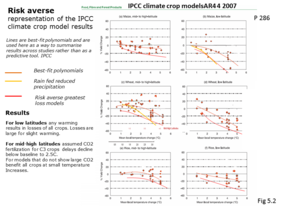 The IPCC correctly says these model results should not be used for predicting (text below Fig 5.2), but in the policy maker summaries these model results are to basis for predictions made on crop yield results. ​​​​The result is that it is incorrectly assumed that the temperate northern hemisphere regions will gain in food production, which is not the case, and the disastrous impacts on most climate change vulnerable populations are underestimated. ​​Figure 5.2. Sensitivity of cereal yield to climate change for maize, wheat and rice, as derived from the results of 69 published studies at multiple simulation sites, against mean local temperature change used as a proxy to indicate magnitude of climate change in each study. Responses include cases without adaptation (red dots) and with adaptation (dark green dots). Adaptations represented in these studies include changes in planting, changes in cultivar, and shifts from rain-fed to irrigated conditions. Lines are best-fit polynomials and are used here as a way to summarise results across studies rather than as a predictive tool. The studies span a range of precipitation changes and CO2 concentrations, and vary in how they represent future changes in climate variability. For instance, lighter-coloured dots in (b) and (c) represent responses of rain-fed crops under climate scenarios with decreased precipitation. ​​Although several studies confirm TAR findings that elevated CO2 may ameliorate otherwise negative impacts from ozone (Kaakinen et al., 2004), the essence of the matter should be viewed the other way around: increasing ozone concentrations in future decades, with or without CO2 increases, with or without climate change, will negatively impact plant production, possibly increasing exposure to pest damage (Ollinger et al., 2002; Karnosky, 2003). Current risk-assessment tools do not sufficiently consider these key interactions. Improved modelling approaches that link the effects of ozone, climate change, and nutrient and water availability on individual plants, species interactions and ecosystem function are needed (Ashmore, 2005). ​NRC 2010. The expected impacts illustrated in Figure 5.1 are useful as a measure of the likely direction and magnitude of average yield changes, but fall short of a complete risk analysis, which would, for instance, estimate the chance of exceeding critical thresholds. The existing literature identifies several prominent sources of uncertainty, including those related to the magnitude of local warming per degree global temperature increase, the sensitivity of crop yields to temperature, the CO2 levels corresponding to each temperature and the magnitude of CO2 fertilization. The impacts of rainfall changes can also be important at local and regional scales, although at broad scales the modelled impacts are most often dictated by temperature and CO2. In addition, although the studies summarized in Figure 5.1 consider several of the main processes that determine yield response to weather, several other processes have not been adequately quantified. These include responses of weeds, insects, and pathogens; changes in water resources available for irrigation; effects of changes in surface ozone levels; effects of increased flood frequencies; and responses to extremely high temperatures. Moreover, most crop modelling studies have not considered changes in sustained droughts, which are likely to increase in many regions, or potential changes in year-to-year variability of yields. The net effect of these and other factors remains an elusive goal, but these are likely to push yields in a negative direction. Adaptation responses by growers are also poorly understood and could, in contrast, reduce yield losses. ​​Projected changes in the frequency and severity of extreme climate events have significant consequences for food and forestry production, and food insecurity, in addition to impacts of projected mean climate (high confidence). Risk of world food prices ​​rising beyond the reach of the poorest nations and poorest people is all regions is huge. Climate change to small holders pastoralists and subsistence farmers are multiple and together huge. ​diseases, and market shocks) and may be felt by individual households or entire communities. The large climate crop model uncertainties are not being treated as large risks in the assessment reports, but only as need for more modelling. ​Several uncertainties remain unresolved since the TAR. Better knowledge in several research areas is critical to improve our ability to predict the magnitude, and often even the direction, of future climate change impacts on crops, as well as to better define risk thresholds and the potential for surprises, at local, regional and global scales. IPCC 2007 Vulnerability chapter Research tasks not yet undertaken – ongoing uncertainties. Adverse health risks from climate change are added risks to food production and security. Land degradation already ongoing is another risk from global climate change. ​Smallholder and subsistence farming areas are often also environmentally marginal and at risk of land degradation as a result of climate trends, but mediated by farming and livestock-production systems (Dregne, 2000). IPCC 2007 Vulnerability chapter 5.4.7 Rural livelihoods: subsistence and smallholder agriculture. The marginal increase in the number of people at risk of hunger due to climate change must be viewed within the overall large reductions due to socio-economic development. Compared to 820 million undernourished today, the IPCC Special Report on Emissions Scenarios (SRES) scenarios of socio-economic development without climate change project a reduction to 100-230 million (range is over A1, B1, B2 SRES scenarios) undernourished by 2080 (or 770 million under the A2 SRES scenario). Scenarios with climate change project 100-380 million (range includes with and without CO2 effects and A1, B1, B2 SRES scenarios) undernourished by 2080 (740-1,300 million under A2). Climate and socio-economic changes combine to alter the regional distribution of hunger, with large negative effects on sub-Saharan Africa.